A capuchin monkey and saltwater crocodiles are among the animals being kept in Scarborough homes. A capuchin monkey, ring-tailed lemurs and saltwater crocodiles are among the weird and wonderful wild animals being kept privately in the borough of Scarborough. A Freedom of Information request to the borough council by the Local Democracy Reporting Service asked what dangerous animal licences had been granted in its area, and it has thrown up some interesting results. The capuchin monkey is joined in the borough by four ring-tailed lemurs, more commonly found in Madagascar, and a whole host of animals with sharp teeth. There are two adult American alligators, along with two juveniles, a female Siamese crocodile, two juvenile saltwater crocodiles and six caiman, including the spectacled and dwarf varieties. The spectacled caiman is mostly found living in low wetland areas in Central or South America. They are classed as small to medium-sized crocodiles but males can grow more than two metres long while females can reach more than 1.4 metres. The American alligator can grow to a massive 4.8m in length and is an appex predator which feasts on fish, reptiles birds and mammals and can live for around 50 years. The saltwater crocodiles kept in Scarborough may only be juveniles but the males can grow up to 6m in length, making it the largest of all living reptiles. At the other end of the scale, a capuchin monkey (Cebus apella) will be well known to people as they are common in films and on television shows, such as Raiders of the Lost Ark, The Hangover Part 2 and Friends. 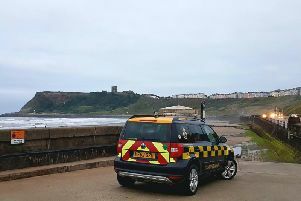 Anyone wishing to keep an animal listed in the Dangerous Wild Animals Act in the borough requires a licence from Scarborough Council. The applicant has to show the animal will be cared for and have access to food and an area to exercise. They must also show the animal will not be a danger to the public or cause a nuisance to neighbours. Zoos, circuses and pet shops are exempt from the legislation.